The festive season might just have gotten a little more merry and festive. 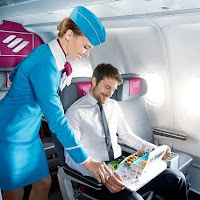 Eurowings have offered a special gift for Advent. As of today, the airline’s customers can book unbeatably cheap flight tickets to the world’s most beautiful destinations from as little as EUR 29.99, now that is sure to please Santa and add a little extra special Christmas spirit to the rest of us. The discounted Advent flight tickets can be booked until Sunday, 10.12.2017, via www.eurowings.com or the Eurowings app on smartphone and tablet, and they can be redeemed flexibly up to the end of April 2018. Maybe now you give a gift where literally the sky is the limit. So if you haven’t already purchased all your Christmas presents, maybe a low-cost Advent flight tickets from Eurowings is the answer. It's perfect for anyone, including your most favourite travel blog writer.